Chocolate Covered Caramelized Almonds for sale. Buy online at Zingerman's Mail Order. Gourmet Gifts. Food Gifts. Sweet, salty, crunchy, nutty, Hungarian. Rózsavölgyi Csokoládé (say that three times fast) is a Hungarian bean-to-bar chocolate company that makes some incredibly tasty confections. They source, roast, winnow and mix their own chocolate for their confections, which is a huge amount of work. 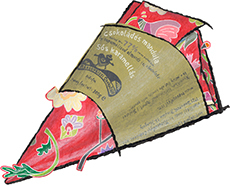 But I’ll confess, it was the packaging that first caught my eye: brightly decorated Hungarian designed paper, folded into a colorful cone. Inside are roasted, salted almonds, caramelized in a sweet, crisp jacket of cane sugar. The nuts are covered in 77% dark chocolate and dusted with cocoa powder and a touch of Himalayan salt. Each bite is sweet and slightly salty, nutty, crunchy and just a bit chocolate-y. A beautiful, delicious gift for your valentine or anyone that likes to get a little nutty with their sweet treats.